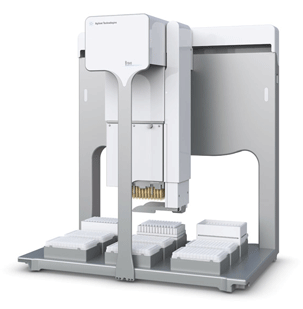 The Agilent (formerly Velocity 11) Bravo is compact (70 x 65cm) benchtop liquid handler. With user- interchangeable 96 and 384 heads, Bravo has a dynamic range of 100nl to 200ul. A versatile general purpose platform for plate replication, reformatting and serial dilutions, Bravo can also be configured for more complex molecular biology or cell based assays as a stand alone workstation. Additionally, Bravo may be integrated into a larger automation system using either Agilent’s powerful VWorks software or other off-the-shelf scheduling/integration software such as Thermo Fisher’s Momentum, PAA’s Overlord 3, Brooks Automation’s Sprint 6 or Retisoft’s Nexus or Genera. Hardware options available; 96 channel head, 384 channel head, plate gripper, temperature controlled locators, plate filtration, tip washing, bar code reader…many more!